Aim: The aim is to review and discuss the strategies available for use of platelet rich fibrin as healing aid in dentistry. Background: Platelet rich fibrin (PRF) is a fibrin matrix in which platelet cytokines, growth factors, and cells are trapped and may be released after a certain time and that can serve as a resorbable membrane. Choukroun and his associates were amongst the pioneers for using PRF protocol in oral and maxillofacial surgery to improve bone healing in implant dentistry. Autologous PRF is considered to be a healing biomaterial, and presently, studies have shown its application in various disciplines of dentistry. Materials and Methods: By using specific keywords, electronic search of scientific papers was carried out on the entire PubMed database with custom range of 5 years. The electronic search yielded 302 papers; based on inclusion and exclusion criteria which were specifically predetermined, 72 papers were identified as suitable to the inclusion criteria and the remaining 230 papers were excluded. After adding three more selected papers through hand search, full text of all the articles retrieved and review was done. By pooling the extracted data from selected papers, the reviewed data was synthesized. Conclusion: Recently by showing good promising results with use of the PRF, it has proved to have a good prospect for its use as healing aid in various aspects of the dentistry. In 1974, platelets regenerative potentiality was introduced, and Ross et al.,  were first to describe a growth factor from platelets. After activation of the platelets which are trapped within fibrin matrix, growth factors released and stimulate the mitogenic response in the bone periosteum during normal wound healing for repair of the bone. Better understanding of physiologic properties of platelets in wound healing since last two decades led to increase its therapeutic applications in the various forms showing varying results. Structured electronic search of scientific papers published up to 15 th March 2013 was carried out on the ( http://www.ncbi.nlm.nih.gov/pubmed ) entire PubMed database with a custom range of 5 years and hand search for term "platelet rich fibrin" (PRF); which was further filtered using Boolean operators (AND, OR, NOT) and combination of specific keywords as following: "Platelet rich fibrin Choukroun", "platelet rich fibrin in dentistry", "platelet rich fibrin dental", "platelet rich fibrin in maxillofacial surgery", "platelet rich fibrin implant", "platelet rich fibrin periodontal", "platelet rich fibrin extraction", and "platelet rich fibrin oral"; abstracts of all relevant papers were thoroughly scrutinized and in the end and articles pertaining to the topic (PRF) were included. Relevant literature for "platelet rich fibrin" in common dental textbooks and for additional information bibliographies of papers and review articles together with appropriate peer reviewed journals were also scrutinized. The inclusion criteria set for this review were: All case reports, case series, original research papers, review papers, in vitro/in vivo studies, animal studies, and controlled clinical trials on PRF used in dentistry related studies. Exclusion criteria consisted of studies that did not meet the above inclusion criteria. The electronic search yielded 302 papers, out of which 72 were identified as suitable papers to the inclusion criteria and the remaining 230 were excluded [Figure 1]. 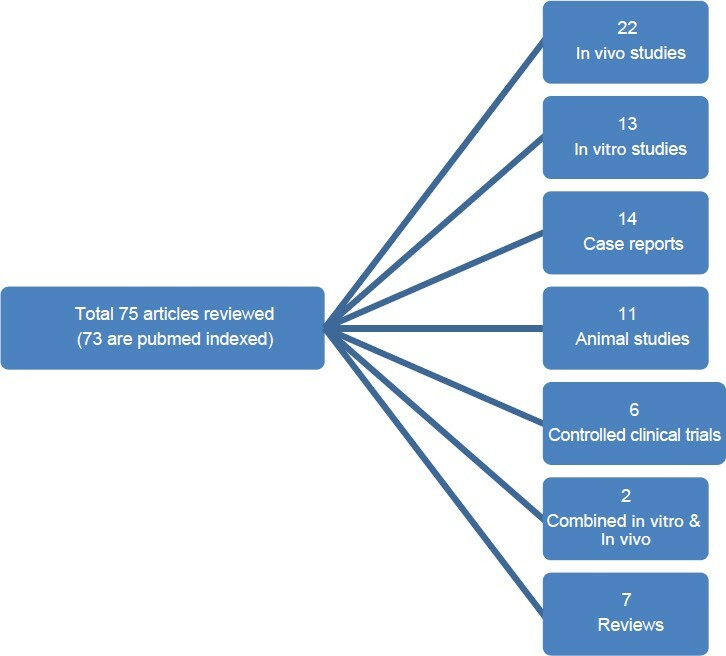 Only 75 papers selected, 72 from electronic search and three from other searches and full text of all articles retrieved and reviewed [Table 1], out of which 22 in vivo studies, 13 in vitro studies, 14 case reports, 11 animal studies, six controlled clinical trials, two combined in vivo and in vitro studies, and seven reviews [Figure 2]. Platelets isolated from the peripheral blood acts as autologous source of growth factors. In general medical practice, platelet concentrate which is derived from blood can be used for the prevention and treatment of bleeding due to conditions like severe thrombocytopenia, severe oral hemorrhage associated with medullary aplasia, acute leukemia, etc. The use of fibrin adhesives helps to initiate the development of platelet concentrate as a bioactive surgical additive. Several components in blood has been recognized since 1990, which are a part of the natural healing process and have the potential to accelerate wound healing when added to wounded tissues or surgical sites. 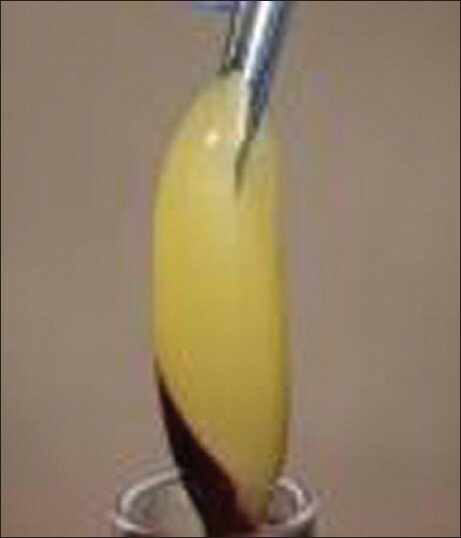 In 1970, fibrin glue formed by polymerizing fibrinogen with thrombin and calcium was first described. Actually, it was prepared using donor plasma; but the stability and quality of fibrin glue was low because of low concentration of fibrinogen in plasma. These fibrin adhesives can be derived autologously from the patient or can be obtained commercially, but with a small risk of disease transmission for the latter one. It has been shown in several studies that bone regenerative procedures may be enhanced by the addition of specific growth factors. 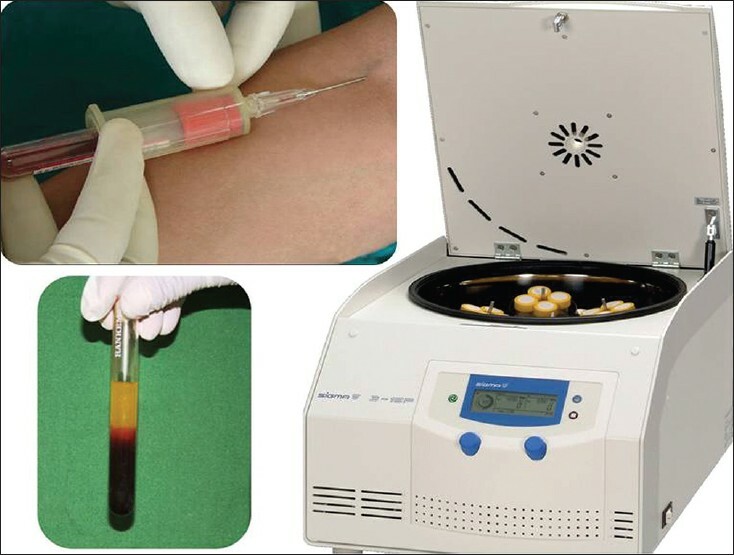 platelet rich plasma (PRP) was used as a method of introducing concentrated growth factors platelet-derived growth factor (PDGF), transforming growth factor-beta (TGF-β), and insulin-like growth factor 1 (IGF-1) to the surgical site, thereby enriching the natural blood clot in order to hasten wound healing and stimulate bone regeneration. A natural human blood clot consists of 95% red blood cells (RBCs), 5% platelets, less than 1% white blood cells (WBCs), and numerous amounts of fibrin strands. A PRP blood clot, on the other hand, contains 4% RBCs, 95% platelets, and 1% WBCs. 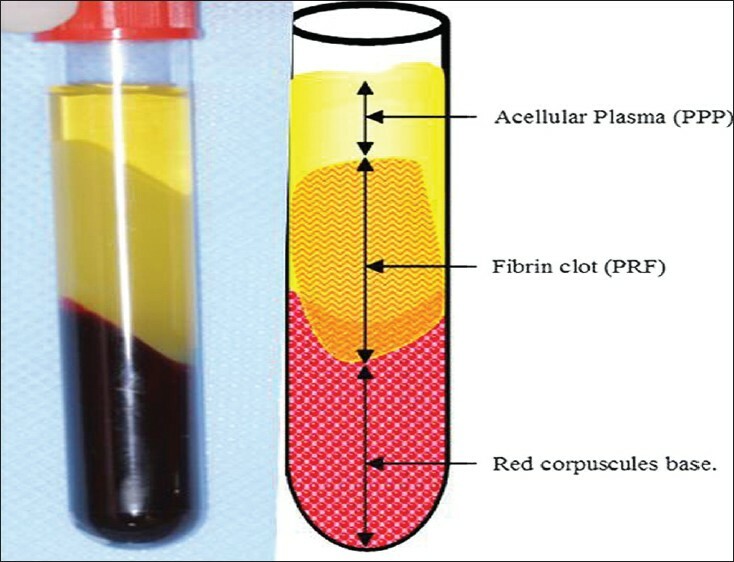 The PRP preparation protocol requires collection of blood with anticoagulant, centrifugation in two steps, and induced polymerization of the platelet concentrate using calcium chloride and bovine thrombin. PRP has been used in conjunction with different grafting materials in bone augmentation procedures since the day of its introduction; the results from these studies are controversial and no conclusions can be drawn regarding the bone regenerative effect of PRP till date. PRF represents a new revolutionary step in the platelet gel therapeutic concept. Unlike other platelet concentrates, this technique does not require any gelifying agent, but not more than centrifugation of the natural blood without additives. Choukroun et al.,  developed the PRF in 2001 at France and the production protocol of PRF attempts to accumulate platelets and released cytokines in a fibrin clot. Actually the platelets and leukocyte cytokines are important part in role play of this biomaterial, but the fibrin matrix supporting them is very helpful in constituting the determining elements responsible for real therapeutic potential of PRF. Cytokines are immediately used and destroyed in a healing wound. The harmony between cytokines and their supporting fibrin matrix has much more unique importance than any other constant. A fibrin glue, enriched with cytokines (such as PRP) with large uncontrollable and short-term effect is less better than a physiologic fibrin matrix (such as PRF) with good and better effects. The protocol for PRF preparation is very simple and simulates that of PRP. It includes collection of whole venous blood (around 5 ml) in each of the two sterile vacutainer tubes (6 ml) without anticoagulant and the vacutainer tubes are then placed in a centrifugal machine [Figure 3] at 3,000 revolutions per minute (rpm) for 10 min, after which it settles into the following three layers: Upper straw-colored acellular plasma, red-colored lower fraction containing red blood cells (RBCs), and the middle fraction containing the fibrin clot [Figure 4]. The upper straw-colored layer is then removed and middle fraction is collected, 2 mm below to the lower dividing line, which is the PRF [Figure 5]. The mechanism involved in this is; the fibrinogen concentrated in upper part of the tube, combines with circulating thrombin due to centrifugation to form fibrin. A fibrin clot is then formed in the middle between the red corpuscles at bottom and acellular plasma at the top. The middle part is platelets trapped massively in fibrin meshes. The success of this technique entirely depends on time gap between the blood collection and its transfer to the centrifuge and it should be done in less time. The blood sample without anticoagulant, starts to coagulate almost immediately upon contact with the glass, and it decreases the time of centrifugation to concentrate fibrinogen. Following proper protocol and quick handling is the only way to obtain a clinically usable PRF clot charged with serum and platelets. Resistant autologous fibrin membranes may be available by driving out the fluids trapped in fibrin matrix. Choukroun et al.,  are well known for using autologous PRF protocol in oral and maxillofacial surgery to improve bone healing in implant dentistry. The most common encountered problems are lack of adequate bone and proximity to anatomic structures at the implantation site and recent advancements of PRF usage in surgical procedures can predictably combat such difficulties. PRF first described by Choukroun et al.,  is a new second generation of platelet concentrate. Simplified processing technique without any complex handling makes it superior to PRP. PRF can be used to promote wound healing, bone regeneration, graft stabilization, wound sealing, and hemostasis. Because the fibrin matrix is better organized, it is able to more efficiently direct stem cell migration and the healing program. Release of growth factors from PRF through in vitro studies and good results from in vivo studies led to optimize the clinical application of PRF. It was shown that there are better results of PRF over PRP. Dohan et al.,  proved a slower release of growth factors from PRF than PRP and observed better healing properties with PRF. It was observed and shown that the cells are able to migrate from fibrin scaffold; while some authors demonstrated the PRF as a supportive matrix for bone morphogenetic protein as well. Although PRF belongs to a new generation of platelet concentrates, the biologic activity of fibrin molecule is enough in itself to account for significant cicatricial capacity of the PRF. The slow polymerization mode confers to PRF membrane as a particularly favorable physiologic architecture to support the healing process. However, it is now necessary to look further into platelet and inflammatory features of this biomaterial. Only a perfect understanding of its components and their significance will enable us to comprehend the clinical results obtained and subsequently extend the fields of therapeutic application of this protocol. 1. Dohan DM, Choukroun J, Diss A, Dohan SL, Dohan AJ, Mouhyi J, et al. Platelet-rich fibrin (PRF): A second-generation platelet concentrate. Part I: Technological concepts and evolution. Oral Surg Oral Med Oral Pathol Oral Radiol Endod 2006;101:e37-44. 2. Gassling VL, Açil Y, Springer IN, Hubert N, Wiltfang J. Platelet-rich plasma and platelet-rich fibrin in human cell culture. Oral Surg Oral Med Oral Pathol Oral Radiol Endod 2009;108:48-55. 3. Ross R, Glomset J, Kariya B, Harker L. A platelet-dependent serum factor that stimulates the proliferation of arterial smooth muscle cells in vitro. Proc Natl Acad Sci U S A 1974;71:1207-10. 4. Gassling V, Douglas T, Warnke PH, Açil Y, Wiltfang J, Becker ST. Platelet-rich fibrin membranes as scaffolds for periosteal tissue engineering. Clin Oral Implants Res 2010;21:543-9. 5. Sunitha Raja V, Munirathnam Naidu E. Platelet-rich fibrin: Evolution of a second-generation platelet concentrate. Indian J Dent Res 2008;19:42-6. 6. Nevins M, Giannobile WV, McGuire MK, Kao RT, Mellonig JT, Hinrichs JE, et al. Platelet-derived growth factor stimulates bone fill and rate of attachment level gain: Results of a large multicenter randomized controlled trial. J Periodontal 2005;76:2205-15. 7. Soffer E, Ouhayoun JP, Anagnostou F. Fibrin sealants and platelet preparations in bone and periodontal healing. Oral Surg Oral Med Oral Pathol Oral Radiol Endod 2003;95:521-8. 8. Marx RE, Carlson ER, Eichstaedt RM, Schimmele SR, Strauss JE, Georgeff KR. Platelet-rich plasma: Growth factor enhancement for bone grafts. Oral Surg Oral Med Oral Pathol Oral Radiol Endod 1998;85:638-46. 9. Choukroun J, Adda F, Schoeffler C, Vervelle A. Une opportunité en paro-implantologie: Le PRF. Implantodontie 2001;42:55-62. 10. Saluja H, Dehane V, Mahindra U. Platelet-Rich fibrin: A second generation platelet concentrate and a new friend of oral and maxillofacial surgeons. Ann Maxillofac Surg 2011;1:53-7. 11. Choukroun J, Diss A, Simonpieri A, Girard MO, Schoeffler C, Dohan SL, et al. Platelet-rich fibrin (PRF): A second-generation platelet concentrate. Part V: Histologic evaluations of PRF effects on bone allograft maturation in sinus lift. Oral Surg Oral Med Oral Pathol Oral Radiol Endod 2006;101:299-303. 12. Mazor Z, Horowitz RA, Del Corso M, Prasad HS, Rohrer MD, Dohan Ehrenfest DM. Sinus floor augmentation with simultaneous implant placement using Choukroun's platelet-rich fibrin as the sole grafting material: A radiologic and histologic study at 6 months. J Periodontol 2009;80:2056-64. 13. Simonpieri A, Del Corso M, Sammartino G, Dohan Ehrenfest DM. The relevance of Choukroun's platelet-rich fibrin and metronidazole during complex maxillary rehabilitations using bone allograft. Part I: A new grafting protocol. Implant Dent 2009;18:102-11. 14. Simonpieri A, Del Corso M, Sammartino G, Dohan Ehrenfest DM. The relevance of Choukroun's platelet-rich fibrin and metronidazole during complex maxillary rehabilitations using bone allograft. Part II: Implant surgery, prosthodontics, and survival. Implant Dent 2009;18:220-9. 15. Toffler M, Toscano N, Holtzclaw D, Corso MD, Dohan Ehrenfest DM. Introducing Choukroun's platelet rich fibrin (PRF) to the reconstructive surgery milieu. J Implant Adv Clin Dent 2009;1:21-30. 16. Kfir E, Kfir V, Kaluski E. Immediate bone augmentation after infected tooth extraction using titanium membranes. J Oral Implantol 2007;33:133-8. 17. Anilkumar K, Geetha A, Umasudhakar, Ramakrishnan T, Vijayalakshmi R, Pameela E. Platelet-rich-fibrin: A novel root coverage approach. J Indian Soc Periodontol 2009;13:50-4. 18. Kanakamedala A, Ari G, Sudhakar U, Vijayalakshmi R, Ramakrishana T, Emmadi P. Treatment of a furcation defect with a combination of platelet rich fibrin and bone graft-A case report. ENDO (Lond Engl) 2009;3:127-35. 19. Aroca S, Keglevich T, Barbieri B, Gera I, Etienne D. Clinical evaluation of a modified coronally advanced flap alone or in combination with a platelet-rich fibrin membrane for the treatment of adjacent multiple gingival recessions: A 6-month study. J Periodontol 2009;80:244-52. 20. Gassling V, Hedderich J, Açil Y, Purcz N, Wiltfang J, Douglas T. Comparison of platelet rich fibrin and collagen as osteoblast-seeded scaffolds for bone tissue engineering applications. Clin Oral Implants Res 2013;24:320-8. 21. Keyhan SO, Hemmat S, Badri AA, Abdeshahzadeh A, Khiabani K. Use of platelet-rich fibrin and platelet-rich plasma in combination with fat graft: Which is more effective during facial lipostructure? J Oral Maxillofac Surg 2013;71:610-21. 22. Gassling V, Purcz N, Braesen JH, Will M, Gierloff M, Behrens E, et al. Comparison of two different absorbable membranes for the coverage of lateral osteotomy sites in maxillary sinus augmentation: A preliminary study. J Craniomaxillofac Surg 2013;41:76-82. 23. Pradeep AR, Rao NS, Agarwal E, Bajaj P, Kumari M, Naik SB. Comparative evaluation of autologous platelet-rich fibrin and platelet-rich plasma in the treatment of 3-wall intrabony defects in chronic periodontitis: A randomized controlled clinical trial. J Periodontol 2012;83:1499-507. 24. Vinaya Kumar R, Shubhashini N. Platelet rich fibrin: A new paradigm in periodontal regeneration. Cell Tissue Bank 2012. 25. Ozdemir H, Ezirganli S, Isa Kara M, Mihmanli A, Baris E. Effects of platelet rich fibrin alone used with rigid titanium barrier. Arch Oral Biol 2013;58:537-44. 26. Yang KC, Wang CH, Chang HH, Chan WP, Chi CH, Kuo TF. Fibrin glue mixed with platelet-rich fibrin as a scaffold seeded with dental bud cells for tooth regeneration. J Tissue Eng Regen Med 2012;6:777-85. 27. Shivashankar VY, Johns DA, Vidyanath S, Kumar MR. Platelet Rich Fibrin in the revitalization of tooth with necrotic pulp and open apex. J Conserv Dent 2012;15:395-8. 28. Kocyigit ID, Tuz HH, Alp YE, Atil F, Tekin U, Coskunses FM. Correction of postsurgical alveolar ridge defect with vertical alveolar distraction of the onlay block graft. J Craniofac Surg 2012;23:1550-2. 29. Bambal D, Manwar NU, Chandak M, Rudagi K. A comparative evaluation of the healing ability of bilateral periapical lesions treated with and without the use of platelet-rich fibrin. Todays FDA 2012;24:54-7. 30. Bains R, Bains VK, Loomba K, Verma K, Nasir A. Management of pulpal floor perforation and grade II Furcation involvement using mineral trioxide aggregate and platelet rich fibrin: A clinical report. Contemp Clin Dent 2012;3(Suppl 2):S223-7. 31. Tunali M, Ozdemir H, Küçükodacý Z, Akman S, Firatli E. In vivo evaluation of titanium-prepared platelet-rich fibrin (T-PRF): A new platelet concentrate. Br J Oral Maxillofac Surg 2012. 32. Lekovic V, Milinkovic I, Aleksic Z, Jankovic S, Stankovic P, Kenney EB, et al. Platelet-rich fibrin and bovine porous bone mineral vs. platelet-rich fibrin in the treatment of intrabony periodontal defects. J Periodontal Res 2012;47:409-17. 33. Wu CL, Lee SS, Tsai CH, Lu KH, Zhao JH, Chang YC. Platelet-rich fibrin increases cell attachment, proliferation and collagen-related protein expression of human osteoblasts. Aust Dent J 2012;57:207-12. 34. Bielecki T, Dohan Ehrenfest DM, Everts PA, Wiczkowski A. The role of leukocytes from L-PRP/L-PRF in wound healing and immune defense: New perspectives. Curr Pharm Biotechnol 2012;13:1153-62. 35. Del Corso M, Vervelle A, Simonpieri A, Jimbo R, Inchingolo F, Sammartino G, et al. Current knowledge and perspectives for the use of platelet-rich plasma (PRP) and platelet-rich fibrin (PRF) in oral and maxillofacial surgery part 1: Periodontal and dentoalveolar surgery. Curr Pharm Biotechnol 2012;13:1207-30. 36. Simonpieri A, Del Corso M, Vervelle A, Jimbo R, Inchingolo F, Sammartino G, et al. Current knowledge and perspectives for the use of platelet-rich plasma (PRP) and platelet-rich fibrin (PRF) in oral and maxillofacial surgery part 2: Bone graft, implant and reconstructive surgery. Curr Pharm Biotechnol 2012;13:1231-56. 37. Zhang Y, Tangl S, Huber CD, Lin Y, Qiu L, Rausch-Fan X. Effects of Choukroun's platelet-rich fibrin on bone regeneration in combination with deproteinized bovine bone mineral in maxillary sinus augmentation: A histological and histomorphometric study. J Craniomaxillofac Surg 2012;40:321-8. 38. Douglas TE, Gassling V, Declercq HA, Purcz N, Pamula E, Haugen HJ, et al. Enzymatically induced mineralization of platelet-rich fibrin. J Biomed Mater Res A 2012;100:1335-46. 39. Kim BJ, Kwon TK, Baek HS, Hwang DS, Kim CH, Chung IK, et al. A comparative study of the effectiveness of sinus bone grafting with recombinant human bone morphogenetic protein 2-coated tricalcium phosphate and platelet-rich fibrin-mixed tricalcium phosphate in rabbits. Oral Surg Oral Med Oral Pathol Oral Radiol 2012;113:583-92. 40. Jankovic S, Aleksic Z, Klokkevold P, Lekovic V, Dimitrijevic B, Kenney EB, et al. Use of platelet-rich fibrin membrane following treatment of gingival recession: A randomized clinical trial. Int J Periodontics Restorative Dent 2012;32:e41-50. 41. Rudagi KB, Rudagi B. One-step apexification in immature tooth using grey mineral trioxide aggregate as an apical barrier and autologus platelet rich fibrin membrane as an internal matrix. J Conserv Dent 2012;15:196-9. 42. Del Corso M, Mazor Z, Rutkowski JL, Dohan Ehrenfest DM. The use of leukocyte- and platelet-rich fibrin during immediate postextractive implantation and loading for the esthetic replacement of a fractured maxillary central incisor. J Oral Implantol 2012;38:181-7. 43. Lee JW, Kim SG, Kim JY, Lee YC, Choi JY, Dragos R, et al. Restoration of a peri-implant defect by platelet-rich fibrin. Oral Surg Oral Med Oral Pathol Oral Radiol 2012;113:459-63. 44. Mendonça-Caridad J, Lopez PJ, Fayos FV, Miery G. A novel approach to human cranial tissue regeneration and frontal sinus obliteration with an autogenous platelet rich/fibrin-rich composite matrix: 10 patients with a 6-10 year follow-up. J Tissue Eng Regen Med 2012. 45. Pradeep AR, Bajaj P, Rao NS, Agarwal E, Naik SB. Platelet-Rich Fibrin combined with a porous hydroxyapatite graft for the treatment of three-wall intrabony defects in chronic periodontitis: A randomized controlled clinical trial. J Periodontol 2012. 46. Anitua E, Prado R, Orive G. Bilateral sinus elevation evaluating plasma rich in growth factors technology: A report of five cases. Clin Implant Dent Relat Res 2012;14:51-60. 47. Peck MT, Marnewick J, Stephen LX, Singh A, Patel N, Majeed A. The use of leukocyte- and platelet-rich fibrin (L-PRF) to facilitate implant placement in bone-deficient sites: A report of two cases. SADJ 2012;67:54-6:58-9. 48. Clipet F, Tricot S, Alno N, Massot M, Solhi H, Cathelineau G, et al. In vitro effects of Choukroun's platelet-rich fibrin conditioned medium on 3 different cell lines implicated in dental implantology. Implant Dent 2012;21:51-6. 49. Jayalakshmi KB, Agarwal S, Singh MP, Vishwanath BT, Krishna A, Agrawal R. Platelet Rich Fibrin with β-Tricalcium Phosphate-A noval approach for bone augmentation in chronic periapical lesion: A case report. Case Rep Dent 2012;2012:902858. 50. Tatullo M, Marrelli M, Cassetta M, Pacifici A, Stefanelli LV, Scacco S, et al. Platelet Rich Fibrin (PRF) in reconstructive surgery of atrophied maxillary bones: Clinical and histological evaluations. Int J Med Sci 2012;9:872-80. 51. Vijayalakshmi R, Rajmohan CS, Deepalakshmi D, Sivakami G. Use of platelet rich fibrin in a fenestration defect around an implant. J Indian Soc Periodontol 2012;16:108-12. 52. Chang YC, Zhao JH. Effects of platelet-rich fibrin on human periodontal ligament fibroblasts and application for periodontal infrabony defects. Aust Dent J 2011;56:365-71. 53. Taschieri S, Del Fabbro M. Postextraction osteotome sinus floor elevation technique using plasma-rich growth factors. Implant Dent 2011;20:418-24. 54. Sammartino G, Dohan Ehrenfest DM, Carile F, Tia M, Bucci P. Prevention of hemorrhagic complications after dental extractions into open heart surgery patients under anticoagulant therapy: The use of leukocyte- and platelet-rich fibrin. J Oral Implantol 2011;37:681-90. 55. Sharma A, Pradeep AR. Treatment of 3-wall intrabony defects in patients with chronic periodontitis with autologous platelet-rich fibrin: A randomized controlled clinical trial. J Periodontol 2011;82:1705-12. 56. Roy S, Driggs J, Elgharably H, Biswas S, Findley M, Khanna S, et al. Platelet-rich fibrin matrix improves wound angiogenesis via inducing endothelial cell proliferation. Wound Repair Regen 2011;19:753-66. 57. Thorat M, Pradeep AR, Pallavi B. Clinical effect of autologous platelet-rich fibrin in the treatment of intra-bony defects: A controlled clinical trial. J Clin Periodontol 2011;38:925-32. 58. Sharma A, Pradeep AR. Autologous platelet-rich fibrin in the treatment of mandibular degree II furcation defects: A randomized clinical trial. J Periodontol 2011;82:1396-403. 59. Ruga E, Gallesio C, Boffano P. Platelet-rich fibrin and piezoelectric surgery: A safe technique for the prevention of periodontal complications in third molar surgery. J Craniofac Surg 2011;22:1951-5. 60. Kim BJ, Kwon TK, Baek HS, Hwang DS, Kim CH, Chung IK, et al. A comparative study of the effectiveness of sinus bone grafting with recombinant human bone morphogenetic protein 2-coated tricalcium phosphate and platelet-rich fibrin-mixed tricalcium phosphate in rabbits. Oral Surg Oral Med Oral Pathol Oral Radiol Endod 2011. 61. Lee JW, Kim SG, Kim JY, Lee YC, Choi JY, Dragos R, et al. Restoration of a peri-implant defect by platelet-rich fibrin. Oral Surg Oral Med Oral Pathol Oral Radiol Endod 2011. 62. Simon BI, Gupta P, Tajbakhsh S. Quantitative evaluation of extraction socket healing following the use of autologous platelet-rich fibrin matrix in humans. Int J Periodontics Restorative Dent 2011;31:285-95. 63. Prakash S, Thakur A. Platelet concentrates: Past, present and future. J Maxillofac Oral Surg 2011;10:45-9. 64. Simonpieri A, Choukroun J, Del Corso M, Sammartino G, Dohan Ehrenfest DM. Simultaneous sinus-lift and implantation using microthreaded implants and leukocyte- and platelet-rich fibrin as sole grafting material: A six-year experience. Implant Dent 2011;20:2-12. 65. Kang YH, Jeon SH, Park JY, Chung JH, Choung YH, Choung HW, et al. Platelet-rich fibrin is a Bioscaffold and reservoir of growth factors for tissue regeneration. Tissue Eng Part A 2011;17:349-59. 66. Peck MT, Marnewick J, Stephen L. Alveolar ridge preservation using leukocyte and platelet-rich fibrin: A report of a case. Case Rep Dent 2011;2011:345048. 67. Liao HT, Chen CT, Chen CH, Chen JP, Tsai JC. Combination of guided osteogenesis with autologous platelet-rich fibrin glue and mesenchymal stem cell for mandibular reconstruction. J Trauma 2011;70:228-37. 68. Kathuria A, Chaudary S, Talwar S, Verma M. Endodontic management of single rooted immature mandibular second molar with single canal using MTA and platelet-rich fibrin membrane: A case report. J Clin Exp Dent 2011;3:e487-90. 69. Toffler M, Toscano N, Holtzclaw D. Osteotome-mediated sinus floor elevation using only platelet-rich fibrin: An early report on 110 patients. Implant Dent 2010;19:447-56. 70. Chang IC, Tsai CH, Chang YC. Platelet-rich fibrin modulates the expression of extracellular signal-regulated protein kinase and osteoprotegerin in human osteoblasts. J Biomed Mater Res A 2010;95:327-32. 71. Ari G, Anil Kumar K, Ramakrishnan T. Treatment of an intrabony defect combined with an endodontic lesion: A case report. Endo (lond Engl) 2010;4:215-22. 72. Huang FM, Yang SF, Zhao JH, Chang YC. Platelet-rich fibrin increases proliferation and differentiation of human dental pulp cells. J Endod 2010;36:1628-32. 73. Jang ES, Park JW, Kweon H, Lee KG, Kang SW, Baek DH, et al. Restoration of peri-implant defects in immediate implant installations by Choukroun platelet-rich fibrin and silk fibroin powder combination graft. Oral Surg Oral Med Oral Pathol Oral Radiol Endod 2010;109:831-6. 74. Gürbüzer B, Pikdöken L, Tunali M, Urhan M, Küçükodaci Z, Ercan F. Scintigraphic evaluation of osteoblastic activity in extraction sockets treated with platelet-rich fibrin. J Oral Maxillofac Surg 2010;68:980-9. 75. Dohan Ehrenfest DM, Doglioli P, de Peppo GM, Del Corso M, Charrier JB. Choukroun's platelet-rich fibrin (PRF) stimulates in vitro proliferation and differentiation of human oral bone mesenchymal stem cell in a dose-dependent way. Arch Oral Biol 2010;55:185-94. 76. Picardi A, Lanti A, Cudillo L, Cerretti R, Dentamaro T, De Angelis G, et al. Rome Transplant Network. Platelet gel for treatment of mucocutaneous lesions related to graft-versus-host disease after allogeneic hematopoietic stem cell transplant. Transfusion 2010;50:501-6. 77. Aleksiæ Z, Jankoviæ S, Dimitrijeviæ B, Divniæ-Resnik T, Milinkoviæ I, Lekoviæ V. The use of platelet-rich fibrin membrane in gingival recession treatment. Srp Arh Celok Lek 2010;138:11-8. 78. Sclafani AP. Applications of platelet-rich fibrin matrix in facial plastic surgery. Facial Plast Surg 2009;25:270-6. 79. He L, Lin Y, Hu X, Zhang Y, Wu H. A comparative study of platelet-rich fibrin (PRF) and platelet-rich plasma (PRP) on the effect of proliferation and differentiation of rat osteoblasts in vitro. Oral Surg Oral Med Oral Pathol Oral Radiol Endod 2009;108:707-13. 80. Kfir E, Goldstein M, Yerushalmi I, Rafaelov R, Mazor Z, Kfir V, et al. Minimally invasive antral membrane balloon elevation-Results of a multicenter registry. Clin Implant Dent Relat Res 2009;11 Suppl 1:e83-91. 81. Dohan Ehrenfest DM, Diss A, Odin G, Doglioli P, Hippolyte MP, Charrier JB. In vitro effects of Choukroun's PRF (platelet-rich fibrin) on human gingival fibroblasts, dermal prekeratinocytes, preadipocytes, and maxillofacial osteoblasts in primary cultures. Oral Surg Oral Med Oral Pathol Oral Radiol Endod 2009;108:341-52. 82. Su CY, Kuo YP, Tseng YH, Su CH, Burnouf T. In vitro release of growth factors from platelet-rich fibrin (PRF): A proposal to optimize the clinical applications of PRF. Oral Surg Oral Med Oral Pathol Oral Radiol Endod 2009;108:56-61. 83. Simon BI, Zatcoff AL, Kong JJ, O'Connell SM. Clinical and histological comparison of extraction socket healing following the use of autologous platelet-rich fibrin matrix (PRFM) to ridge preservation procedures employing demineralized freeze dried bone allograft material and membrane. Open Dent J 2009;3:92-9. 84. Magremanne M, Baeyens W, Awada S, Vervaet C. Solitary bone cyst of the mandible and platelet rich fibrin (PRF). Rev Stomatol Chir Maxillofac 2009;110:105-8. 85. Diss A, Dohan DM, Mouhyi J, Mahler P. Osteotome sinus floor elevation using Choukroun's platelet-rich fibrin as grafting material: A 1-year prospective pilot study with microthreaded implants. Oral Surg Oral Med Oral Pathol Oral Radiol Endod 2008;105:572-9. 86. Lundquist R, Dziegiel MH, Agren MS. Bioactivity and stability of endogenous fibrogenic factors in platelet-rich fibrin. Wound Repair Regen 2008;16:356-63. 87. Choukroun J, Diss A, Simonpieri A, Girard MO, Schoeffler C, Dohan SL, et al. Platelet-rich fibrin (PRF): A second-generation platelet concentrate. Part IV: Clinical effects on tissue healing. Oral Surg Oral Med Oral Pathol Oral Radiol Endod 2006;101:e56-60. 88. Dohan DM, Choukroun J, Diss A, Dohan SL, Dohan AJ, Mouhyi J, et al. Platelet-rich fibrin (PRF): A second-generation platelet concentrate. Part II: Platelet-related biologic features. Oral Surg Oral Med Oral Pathol Oral Radiol Endod 2006;101:e45-50.